Thus the trend of RSS satellite data from September 1997 through August 2009, for instance, would be negative (and not statistically significant) while the trend of the GISS surface data from September 1998 through August 2009 would be positive, and marginally below model projections. Trends starting after 2004 are presumably too short to warrant inclusion. The best discussion of this article is by Lucia here. It seems to me that recent temperature trends are important and bear watching. 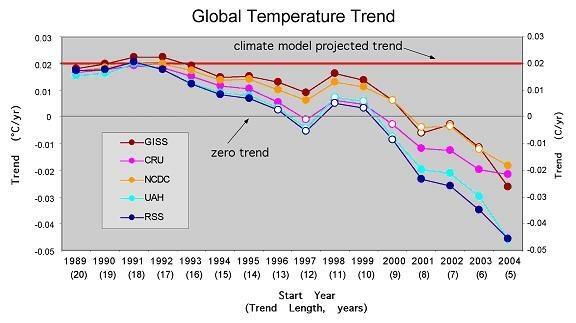 It is probably worth noting that Knappenberger’s chart is volatile, that the entire collec­tion of trends will tend to change as temperatures change. 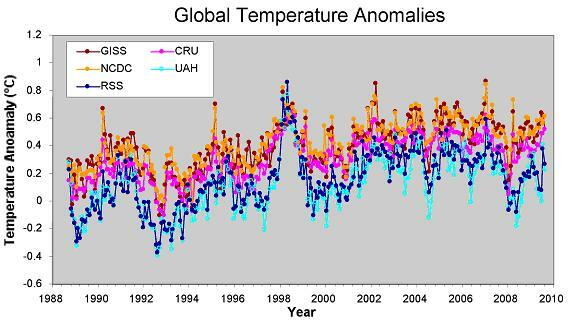 * GISS (Goddard Institute for Space Studies), NCDC (National Climate Data Center), and CRU (Climatic Research Unit) contain data compiled from surface records, while RSS (Remote Sensing Systems) and UAH (University of Alabama-Huntsville) contain data compiled from satellite observations of the lower atmosphere.